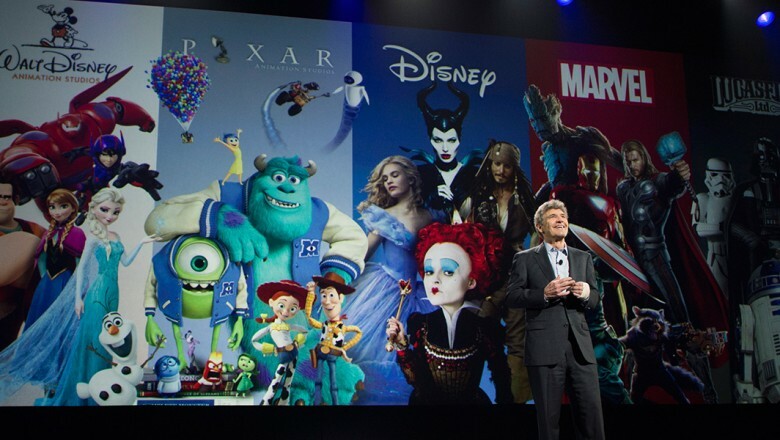 Home / D23 Expo / D23 EXPO 2015 UPDATES / Where the Live Action Is! 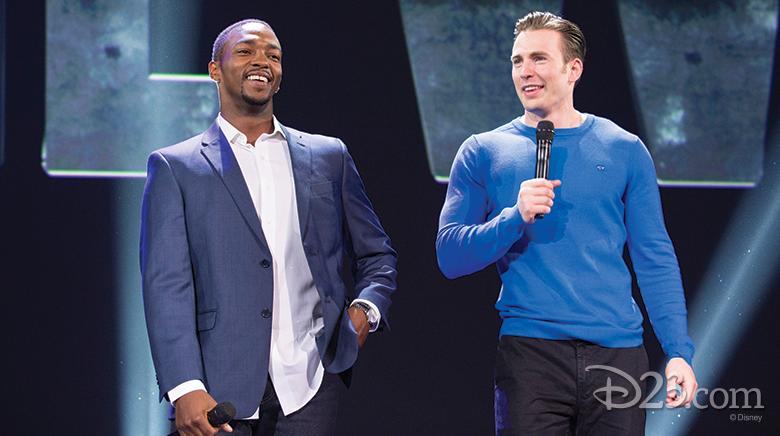 This morning at D23 EXPO 2015, The Walt Disney Studios transported us to “worlds” through the looking glass, to “galaxies” far, far away, and to “universes” filled with Marvel Super Heroes—and a huge announcement at the end to top it off. 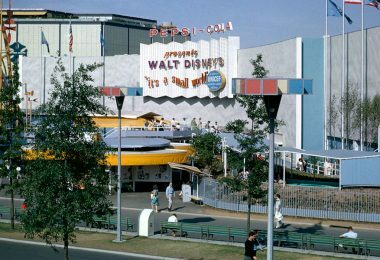 There was no more exciting place to be than Hall D23 at the Anaheim Convention Center. 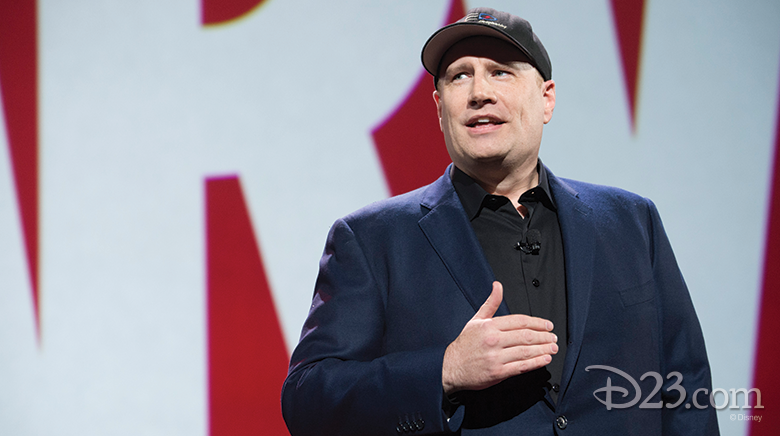 Alan Horn, president of Walt Disney Studios, first brought up president of Marvel Studios Kevin Feige, himself a huge Disney fan and D23 member, who declared this is “the best D23 EXPO yet.” Feige kicked off the Marvel portion of the presentation with Doctor Strange, followed by a sneak peek of Captain America: Civil War. “This is the culmination of everything that has come before in the Marvel Cinematic Universe,” he said, then brought up the film’s stars Anthony Mackie, who plays The Falcon, and Captain America himself—Chris Evans. “I grew up loving Disney. That’s my idea of heaven,” Evans said, before introducing footage from the film—footage that included Iron Man, Ant Man, and an Easter egg—a hidden D23! In April of 2016, Disney will present The Jungle Book. Bailey said, “We strive to honor what’s come before while saying something new” when they reimagine a story from Disney’s rich canon. “One of the most technologically advanced movies ever made,” he said. 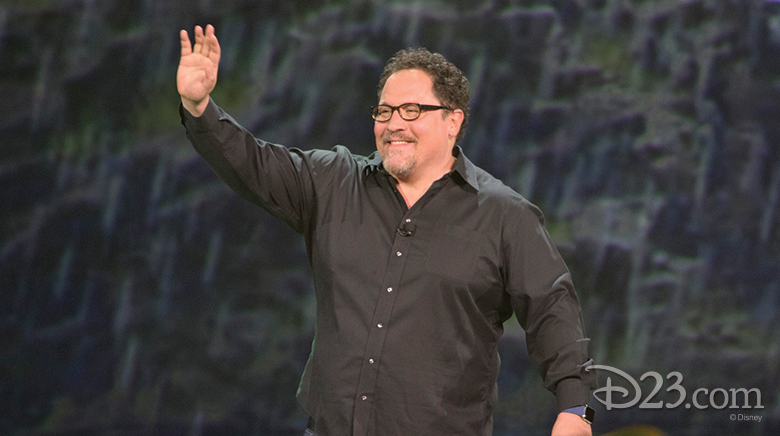 Because the bar was set so high, Jon Favreau was a perfect choice to direct, and an eagerly welcomed guest at the presentation! Favreau was a fan of the animated film, while Alan Horn had a strong connection to the Rudyard Kipling novel. Favreau has spent time with Richard Sherman, who wrote the music for the film, and they’ve talked at length about Walt Disney. “He loved technology,” Favreau said about Walt, and he says Audio-Animatronics were cutting edge for their time. “We tried to extend that legacy.” And Favreau believes that the best CG technology is the kind that disappears. Cast members Ben Kingsley, Lupita Nyong’o and Neel Sethi, the 11-year-old playing Mowgli. 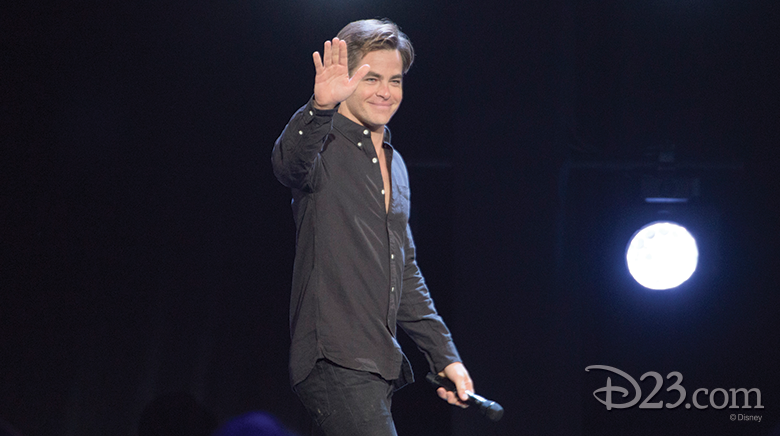 “It was so fun and so awesome,” he told the crowd. Favreau screened very early footage of The Jungle Book for the appreciative crowd—a crowd that only grew louder when Bill Murray, the voice of Baloo, was heard singing a few bars of “The Bare Necessities.” The breathtaking footage brought the crowd to its feet. Continuing the tradition of what Bailey refers to as “the empowered heroine,” Alice Through the Looking Glass was introduced. The film is to be released in May 2016. Many favorites are returning for the film, and a new character, Time, will be played by Sacha Baron-Cohen. Alice, aka Mia Wasikowska, says she grew up watching so many of her fellow cast members, and had a fantastic time shooting the film. A sizzle of the film was shown… and sizzle it did! We can’t wait to go back to Wonderland. 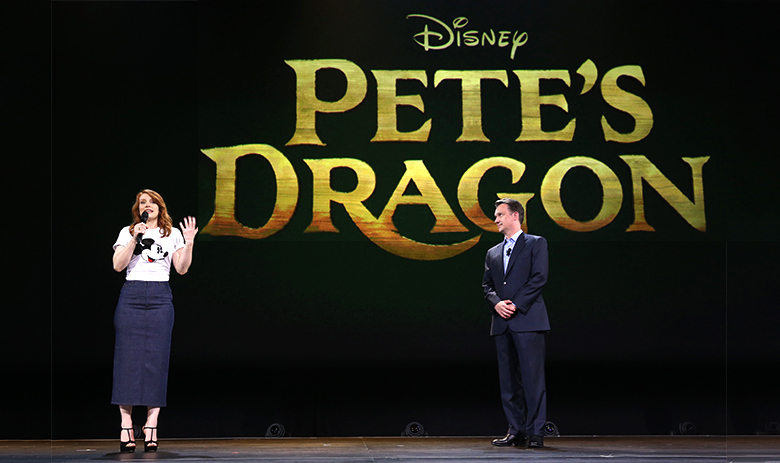 Pete’s Dragon is a beloved classic to so many Disney fans, and the upcoming film will likely become a favorite as well when it debuts in summer 2016. A Mickey Mouse T-shirt-clad Bryce Dallas Howard (Jurassic World) told Hall D23 that she was obsessed with Pete’s Dragon as a child, and loved the idea of being able to revisit the story. “There’s a power in this story, and there’s something very universal that gets told in this. It’s about what it takes to find a family,” Howard said, adding that she can’t wait to share this with her family. In the tradition of McFarland, U.S.A. is The Queen of Katwe, about a young Ugandan girl who becomes a chess master. 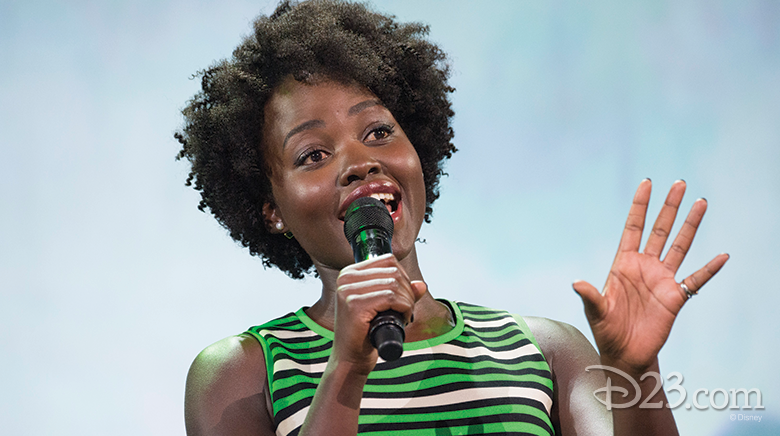 This film stars Lupita Nyong’o, who said it was great to go home to make this movie for Disney and share this story on a world stage. “Uganda is such a vibrant country,” she stressed, and that vibe is a big part of the film. When Bailey said the words, “the tale as old as time,” it was clear we were about to hear about the live-action Beauty and the Beast—which Bailey confirmed is a musical. The film has an all-star cast—“It’s like a fairy tale,” Bailey said—before introducing a video message from Belle, Emma Watson, who, in turn, introduced her co-stars, Luke Evans (Gaston) and Josh Gad (Le Fou). They thrilled the crowd with an a capella rendition of “Gaston,” before Gad urged everyone to make sure to have fun at Disneyland! 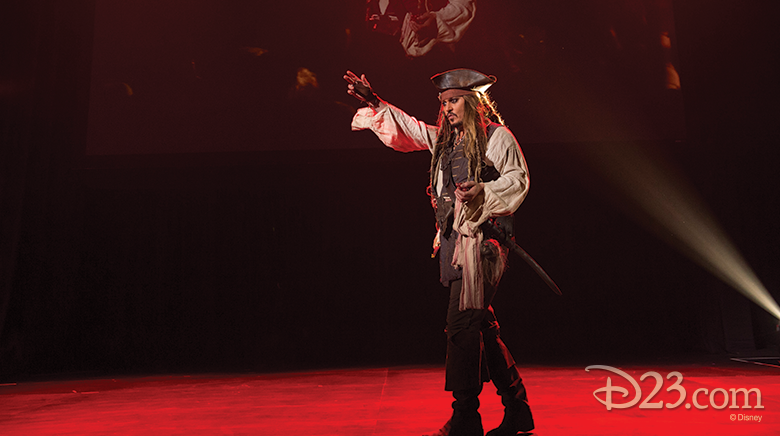 For Pirates of the Caribbean: Dead Men Tell No Tales, Bailey made the announcement that Orlando Bloom is reprising his role as Will Turner, followed by Disney Legend Johnny Depp onstage, in full Captain Jack Sparrow regalia, tossing grapes into the crowd! When Horn returned to the stage, he said, quite rightly, “There’s only one place left to go from here,” and that is, of course, a galaxy far, far away. Horn confirmed that Star Wars Episode IX, to be released in 2019, will be directed by Colin Trevorrow. He discussed the Star Wars Anthology film that will be directed by Christopher Miller and Phil Lord, and is being written by Lawrence Kasdan and his son Jon. 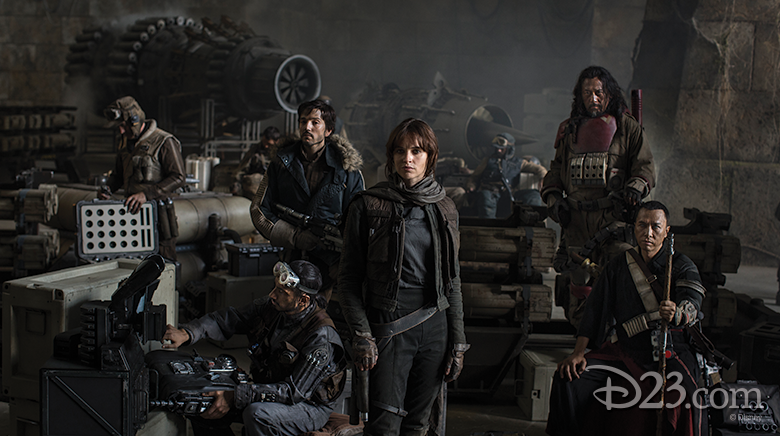 Horn showed us the first cast photo from the set of Rogue One, before returning to the most immediate film in the Star Wars saga, The Force Awakens. 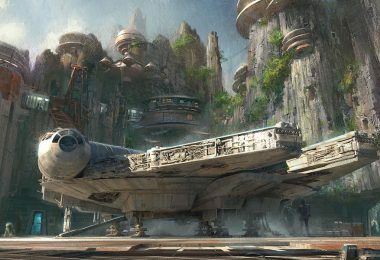 And when it seemed like things couldn’t get more exciting, chairman and CEO Bob Iger came to the stage to make a huge announcement: a brand-new 14-acre Star Wars land addition to Disney theme parks in both Anaheim and Orlando. Each land will include new stories from the films, a full-size cantina with roaming beasts and alien creatures, and a chance to “fly” the Millennium Falcon. What a morning! 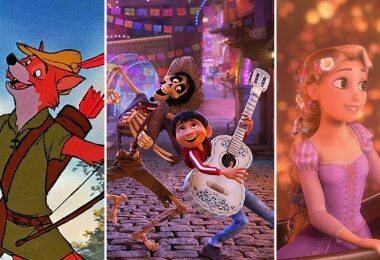 Super heroes, intergalactic space adventures, and live-action adaptations of beloved Disney animated classics. It doesn’t get any better than that.